Israel is denying Palestinians adequate access to clean, safe water while allowing almost unlimited supplies to Israeli settlers in the occupied West Bank, human rights group Amnesty International has said. Amnesty said between 180,000 and 200,000 Palestinians in West Bank rural communities have no access to running water, while taps in other areas often run dry. "Israel allows the Palestinians access to only a fraction of the shared water resources, which lie mostly in the occupied West Bank", Donatella Rovera, an Amnesty researcher, said. Israel, which itself faces unprecedented water shortages, controls much of the West Bank's supplies, pumping from the so-called Mountain Aquifer that bridges Israel and the territory. The Amnesty report said Israel uses more than 80 per cent of water drawn from the aquifer and while Israel has other water sources, the aquifer is the West Bank's only supply of water. In the Gaza Strip, several repair works were under way to improve sanitation before the Israeli blockade was imposed in 2007. But the projects have been on hold under the siege, as Israel is preventing repair materials from coming into the Strip. Adding to an already dire situation, Israel's war on Gaza early this year left water reservoirs, wells, sewage networks and pumping stations severely damaged. The Amnesty report said Gaza's coastal aquifer, its sole fresh water resource, has been polluted by infiltration of seawater and raw sewage and degraded by over-extraction. The water situation in Gaza had now reached a "crisis point," with 90 to 95 per cent of the water supply contaminated and unfit for human consumption, Rovera said. Israel's water authority called the report "biased and incorrect, at the very least" and said that while there is a water gap, it is not nearly as big as presented by Amnesty. The authority said Israel had met its obligations under the Oslo peace agreement but said the Palestinian authorities had failed to meet their own requirements to recycle water and were not distributing water efficiently. In the 1968 film “The Swimmer”, starring Burt Lancaster, the hero hits on the idea of getting home by swimming the length of various pools owned by his rich friends in a leafy north-eastern US state. Captivated by the sight of a string of luminous blue pools stretching into the distance, he embarks on this crazy scheme in what becomes a symbolic plunge into his own fractured psyche. It turns out that Ned, Lancaster’s character, has forgotten what has happened in his own life. The swimming pool plan slowly reveals itself as a disastrous attempt to recover his home and loved ones. The Swimmer comes to mind in relation to the Israeli occupation of the West Bank and East Jerusalem. Why? Because here you have a series of (illegal) Israeli settlements that have provided themselves with large swimming pools while the surrounding Palestinian land is parched and crying out for water. True, no latter-day Lancaster figure is going to “swim the settlements”, but he wasn’t going to in the bone-dry late autumn of upstate New York either. 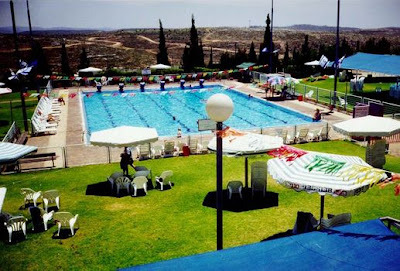 The point is: what are the settlers doing having huge swimming pools while their Palestinian neighbours can’t get enough water to feed their dying livestock? Just as the late-60s Lancaster film was saying something about the moral decay of the moneyed inhabitants of the New York commuter belt - heavy-drinking stockbrokers getting rich while the Vietnam war raged out of sight and out of mind - so the swimming settlers of the West Bank are a standing affront to Palestinian justice and dignity. Here are a few facts. Average daily water consumption on the Palestinian side is 70 litres per day, less than the World Health Organisation’s recommended daily minimum of 100 litres. Israel’s average is over four times higher, at 300 litres. (In the UK it’s about 160). Drill down a little deeper in places like the Jordan Valley or the southern Hebron Hills - which I visited just this Saturday - and the picture is even starker. Many Palestinian farmers, where they haven’t been driven off their land because of “security” closures, are fighting a battle to hold onto water cisterns traditionally used to store rainwater. Israeli soldiers frequently destroy water tanks (snipers even use them as target practice) and the net result is that in some places Palestinian water usage is down to a catastrophic 20 litres per day - emergency humanitarian levels. Crops and animals are dying and farmers are giving up once productive land. To add insult to injury, these same Palestinians will often be able to see lush lawns, well-irrigated fields and even swimming pools - all owned by Israeli settlers who are literally siphoning off the water supply for their own use. In some places settlers are using 20 times more water than their neighbouring Palestinian communities. The sole source of water for West Bank Palestinians is the Mountain Aquifer, entirely controlled by Israel. Israel uses at least 80% of the aquifer’s water with the result that 450,000 settlers consume as much water or more than all of the 2.3 million Palestinian inhabitants of the West Bank combined. Meanwhile how would Burt Lancaster’s swimmer have managed in Gaza? Would he have been able to swim home? Unlikely. In fact he would have found it difficult to get enough clean water to bring up his family and lead a halfway normal life. One and half million Gazans are reliant on the Gaza Strip’s Coastal Aquifer for their water, but this is polluted due to over-extraction and contamination by sewage and seawater. Some 90-95% of it is now unfit for drinking. Israel’s continuing blockade of Gaza is preventing the importation of urgently-needed materials to repair water and sewage treatments works. On top of this, the recent Israeli bombardment of Gaza saw nearly £4 million worth of damage done to Gaza’s water and wastewater infrastructure, with reservoirs, wells, pumping stations and 12.5 miles of water mains damaged or destroyed. Palestinian mismanagement and chronic underfunding have compounded the woes of Palestinian people denied their rightful supply of water, but Israel is the main culprit in this tale of water rights and water wrongs. Palestinians are entitled to water and to live in dignity. At the end of The Swimmer that most dignified of Hollywood actors Burt Lancaster ends the film confronted by a dry pool and a deserted family home. A potent metaphor for what Israel is doing right now to the Palestinians in the West Bank and Gaza.